While many first-person shooters have tried to make the player feel like the protagonist of a hard-boiled action movie, nothing makes it feel as smooth and effortless as Superhot. Countless games have employed a “bullet time” mechanic to slow down the action to a crawl while letting players react to danger in real time, emphasizing the spectacle of the action when it’s at its peak. Superhot goes a step further by bringing time to an almost complete stop, where time progresses only when the player moves. At the same time, players are not bullet sponges that surviving multiple wounds before dying. In Superhot, it’s one hit and you’re done. The result is that the developers have taken the first person shooter formula and remade it into a puzzle game. Players have as long as they need to look around and plan out their movements while bullets inch toward their head. This allows you to make a mental map and plot a course through the carnage. In this way, the action plays out like a ballet with bullets, and it has the side effect of making the player feel awesome. A level might begin with a bartender drawing a gun on you, but you have the chance to consider your options. For example, you can grab a bottle off the table, throw it at the bartender, grab his shotgun out of midair while he’s stunned, shoot him, turn to see two more men coming from the pool table, dodge their bullets, shoot another, throw the empty shotgun at the third man, and finish him off with a punch. Most satisfying of all this though, is the replay that comes at the end of a level, where the action is replayed to you at full speed, showing you how you deftly navigated the maze of ammunition and took out a small army without taking so much as a scratch. All the while, a disembodied voice repeats the words “SUPER. HOT. SUPER. HOT.” It’s a weirdly empowering capstone to the mental gymnastics you undertook to reach that point. The world is rendered in mostly white and grey, with textureless geometric objects, and your opponents are red, crystalline polygon men who shatter like glass when shot or punched. While the simplistic representation of the world no doubt has the practical benefit of saving processing power, it doubles as a slick stylistic choice, Additionally, it takes some of the edge off the visceral nature of up-close, slow motion gunfights. Superhot just wouldn’t have the same clean presentation if you were fighting an army of Agent Smith lookalikes in a drab-looking warehouse. The one hit kill nature of the combat might become a detriment if the levels were not parceled out in enjoyable, bite-size chunks. The gameplay on its own would be compelling enough, and I’d be perfectly happy being dropped in a series of action scenarios. You’re in an alley with a speeding car one moment and facing a drug deal gone bad in another. But in addition, the story creates a driving force to work through the game’s missions beyond just seeing the next action scene. The story also never becomes overbearing or convoluted, and it wraps up before the gameplay overstays its welcome. New mechanics are introduced continuously throughout the game, to the point where it feels like Superhot in its current form could just be a long introduction to a much longer puzzle game. While the game is excellent, it’s also begging to be expanded upon. The core concept is so unique and fresh that there are many places the developer could take it from here. So it’s a little disappointing that it takes only two or three hours to play through, when the possibilities seem limitless. The asking price of $24.99 might seem high for the value conscious out there, but there’s really nothing else like this currently available. Which is why I can’t wait to play Superhot 2. 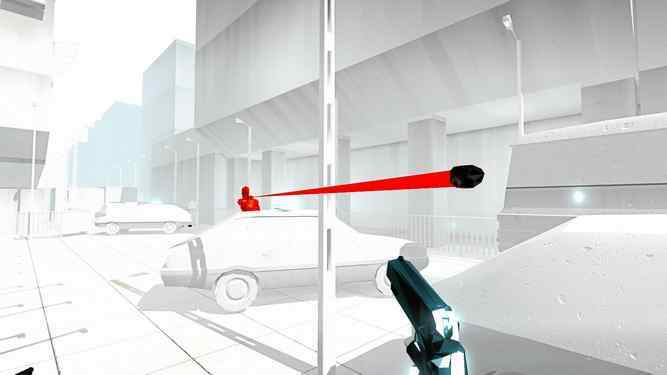 Superhot developer SUPERHOT Team provided a review copy of the game for the purposes of this article.